Includes all of the songs from REVIVAL GENERATION: 12 SONGS THAT ROCKED A NATION, CUTTING EDGE by Delirious?, PASSION: LIVE WORSHIP FROM THE 268 GENERATION, THE FRIENDSHIP AND THE FEAR by Matt Redman, WORSHIP TOGETHER LIVE: KING OF LOVE and KING OF FOOLS by Delirious? 11 - Did You Feel The Mountains Tremble? 71 - What Is This Thing Called Love? 72 - Who Is There Like You? 73 - Who Paints The Skies? 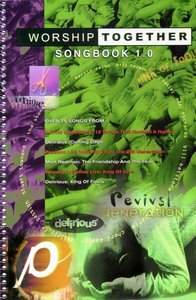 About "Worship Together Songbook 1.0"
Over 75 songs from Revival Generation, Delirious, Passion, Matt Redman and others! Includes: All Heaven Declares * All I Want Is You * Believer * Bowing Down * Can a Nation Be Changed * Deeper * Find Me in the River * Fire * Here I Am * I've Found Jesus * I Will Enter In * King of Love * Listen to Our Hearts * Oh Our Lord and King * Prophet Song * Revival Town * Singers Song * Sweet Mercies * The Happy Song * There Is Joy in the Land * We Fall Down * Who Paints the Skies? (River of Fire) * You Alone * and more. Features indexes by key, tempo and project. Spiral bound.